The Church of God movement is one born out of a devout commitment to telling the ongoing story of how God is at work among his people. The Church of God is in the business of changing the world around them by making Jesus the subject, and by demonstrating the love of Christ, just as Jesus did. A large part of this narrative, that is both historical and still permeates into congregational discourse communities today, is the role of women within the scope of the movement. While women have historically been involved in the movement’s continuation and growth, it would be a disservice to acknowledge them as simply behind-the-scenes operators when, in fact, they have long been at the forefront of precipitating change. One of the most highly revered and remembered female leaders within the Church of God movement was Rev. 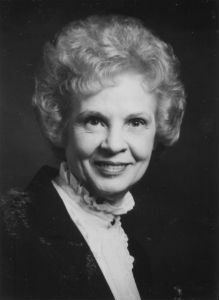 Lillie S. McCutcheon, a devoted minister whose call brought together countless lives over the course of her forty-three years of pastoral care and guidance. In April 1945, Lillie began her life’s ministry in Newton Falls, Ohio, acting as one of the most influential female pastors in the movement’s history. Her initial congregation was small, comprised of mostly women, and lacking a permanent meeting location. Pastor Lillie, however, led the community boldly, beginning in an interim leadership role but eventually moving into a more stabilizing position as an ordained pastor. She was ordained on January 2, 1947, just eight days before the wedding ceremony of her dear friends, which she had been asked to officiate. Photo: Among local male pastors, Pastor Shannon stands confident in the Christ who called her. Out of Lillie’s trailblazing efforts, countless women were inevitably destined to follow in her footsteps and rise up as leaders within the Church of God. Among them is Shannon New-Spangler, the senior pastor at Harvest Point Church of God in Lordstown, Ohio. 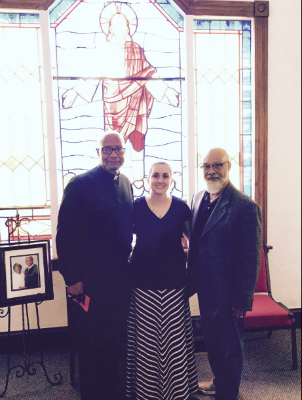 Pastor Shannon began at Harvest Point after her ordination in 2009 after having completed her bachelor of arts in Bible and religion (2002) and her master of divinity (2008), both at Anderson University. While Pastor Shannon feels both supported and encouraged by the congregation that she currently serves, such has not been the case universally in her past experiences. “My story is probably not unique here,” she comments. “Most women I know in ministry have dealt with these and similar issues.” Pastor Shannon said she was often challenged on her call, told “her place” by leaders and congregation members, and kept from certain duties because of her gender. Even finding an initial job pastoring was a challenge for her. “I got so many rejection letters, I stopped counting,” she says. Across the United States, and around the world, God is on the move in the Church of God. Join the movement. Reach our world. Donate today at http://www.jesusisthesubject.org/reach-our-world-fund/. Megan DeBruyn is a 2017 Anderson University graduate and communications assistant at Church of God Ministries. This entry was posted in All Church of God and tagged female, gender equality, Lillie McCutcheon, Lordstown, Newton Falls, OH, Ohio, Shannon New-Spangler, spiritual gifts, women clergy, women in ministry, women ministers, women pastors. Bookmark the permalink.